It all started about 3 years ago after several months of searching Trade-a-Plane I found myself flying across Illinois is a Smith Miniplane. I had never flown anything like this before. 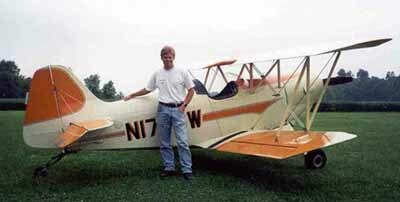 My first experience had begun in a Kolb Firestar at age 14, and progressed to a Cessna 140 at 16. Between looping the Kolb and perfecting 8 point rolls in the 140, (much to my father's dismay) I had decided that aerobatic flying was my thing. The Smith Miniplane was a thing of beauty, it was made for aerobatics. The day I ferried it home I began to do rolls as soon as I was sure that my concerned seller could no longer see his airplane. The ailerons were light and quick, making rolling a pleasure. My first indication that 85 hp. was going to get boring however, was soon after lifting off, when it totally failed to rocket into the sky like a Sukhoi or an Extra. Now as I began doing snap rolls, I found maintaining speed to be a real problem. I kept the Smith for the next year, finding that the secret to performing consecutive maneuvers was to start really high and end low. Like most others I'd found that when doing aerobatics you can never have enough power. I sold the Smith at Oshkosh the following summer and hit the Trade-a-Plane. After a while I began to realize that my 10K was not going to buy me much more than what I had. What I wanted cost over 100K. So, after a year of boredom and un-increasing wealth I decided to head to the shop.